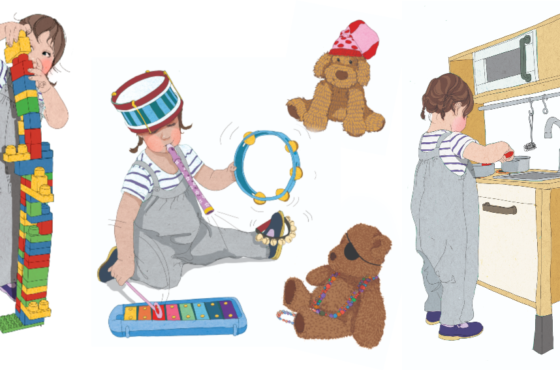 We are so excited to be part of the Creative Valentine’s Day Activities for Kids Blog Hop put on by Barefeet on the Dashboard. 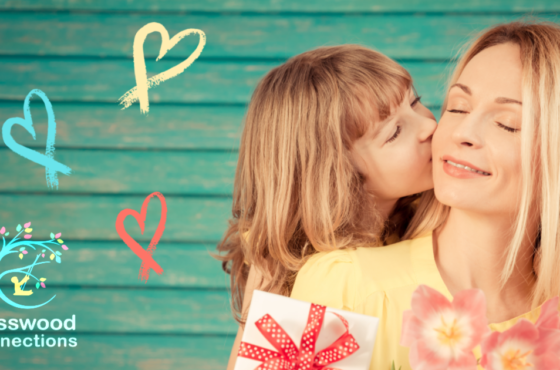 Be sure to check out all the fabulous Valentine’s activities from so many talented bloggers. One of the best parts of my job is that I have the freedom to follow the child’s interests and build in skills based on what they like. One young girl that I work with loves art projects. She is happy to do art projects with me for hours. 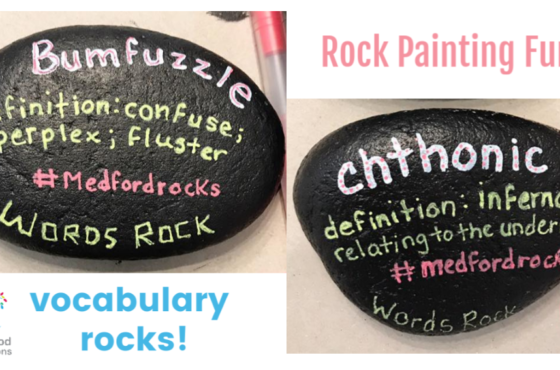 Rather than churn out some ready-made valentines I thought this year it would be fun for us to make more personalized valentines for her classmates. Since she is in a special day class I wanted to make sensory friendly valentines with her. 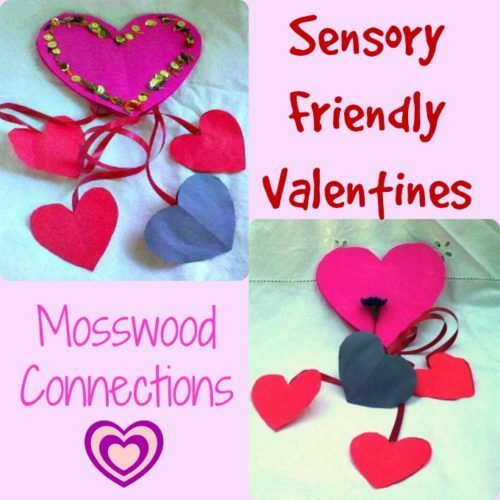 These sensory friendly valentines smell good and can also be used as fidgets for the hands. Cut out 2 large hearts from the card stock. 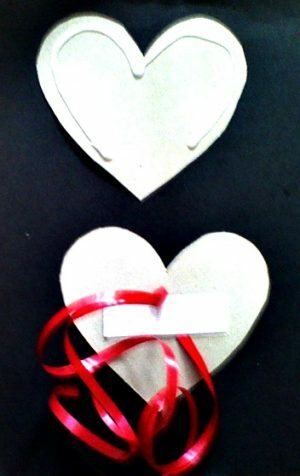 You can use our Heart Templates. Cut out 2 large hearts from the colored paper. Cut out 8 smaller hearts from the colored paper. Cut out a strip from the card stock. Cut two pieces of the string, long enough so when the string is doubled over it will hang below the large heart. Cut small squares out of the cotton pads and apply the essential oil to the cotton pads. We used lavender because it is calming but if you have a child you want to “wake up” use mint essential oil. Apply the glue to the outer edge of the card stock heart. Be sure to leave an opening at the bottom of the heart. Lay the string vertically on the heart and glue the strip of cardstock over the strings. Be careful that the glue is only on the two vertical sides of the card stock so the strings can move freely up and down. Glue the two hearts together. Cover the cardstock with the colored paper hearts. 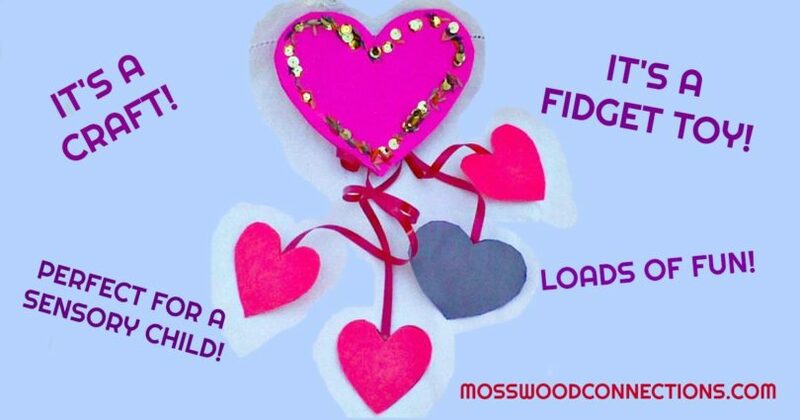 Take the smaller hearts you made with the colored paper and apply the glue around the edges. 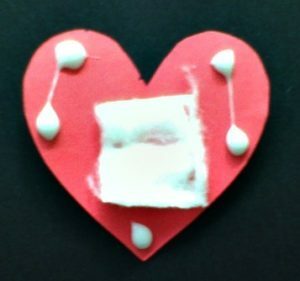 Place the cotton padding in the center of the heart and glue the end of one string down the middle. Put another colored heart on top and press down. Continue with this method until all the strings dangling from the large heart all have a smaller lovely smelling stuffed hearts attached. Decorate the hearts as you wish. 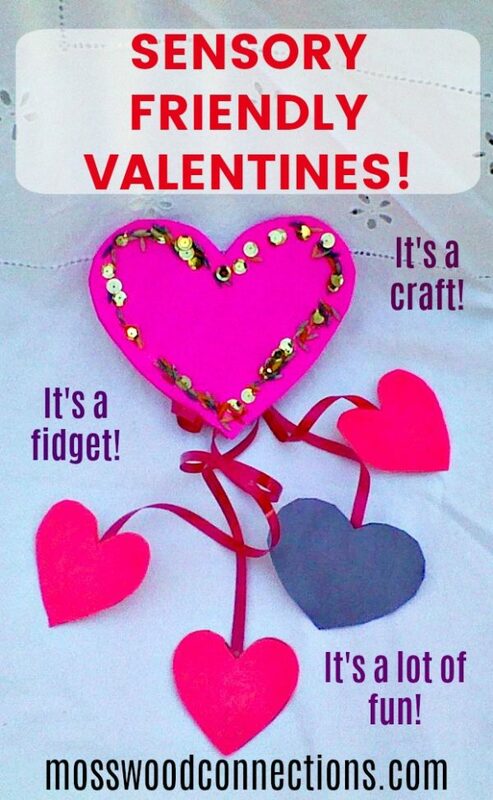 The fun part of this valentine is that you can fidget with the small hearts, by pulling the strings the hearts will go up and down. They also smell really good!